:: Waste Not Do Want: On being an Introverted Extrovert ... Take Note! I've always considered myself and introvert but most think i'm an extrovert because I'm not shy, apparently will talk to anyone and wear 'loud' clothes. But all of the above apply to me! you are the most extroverted intovert I've ever met...thank goodness for you. Glad you loved it... cant wait to read her book. 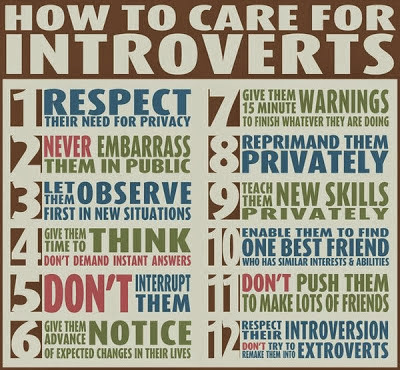 Yes me thinks I may very well be an introverted extrovert... I think sometimes people confuse confidence in a social setting with being extroverted. I can talk to the masses... but I NEED to be on my own.